Playhouse on the Square, Memphis, Tenn.
There’s been a lot of movement in the Memphis theatre community lately. The old Circuit Playhouse was taken over by Theatreworks and renamed the Evergreen Playhouse. Circuit Playhouse moved to Overton Square. Most notably, Memphis’s only professional, resident theatre, Playhouse on the Square, moved into its new building at the corner of Union and Cooper. Inside the new Playhouse on the Square, Memphis, Tenn. 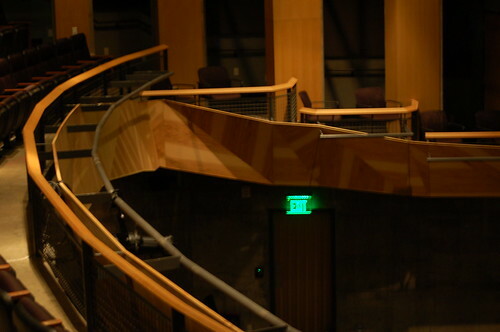 The new, 347-seat theater opened in January. It’s a far cry from Playhouse’s old digs – there are 100 more seats, but the setting is way more intimate (none of the seats are more than 30 feet from the stage). I didn’t realize until my tour guide, Andrew, pointed it out, but all of the theater’s concrete and wood details improve the acoustics in the room. The stage is larger and it’s got all sorts of hidden components (trap doors, an orchestra pit, and 29 fly lines). Meaning, when Peter Pan plays later this year, Peter will actually be able to fly. Main lobby, Playhouse on the Square, Memphis, Tenn. 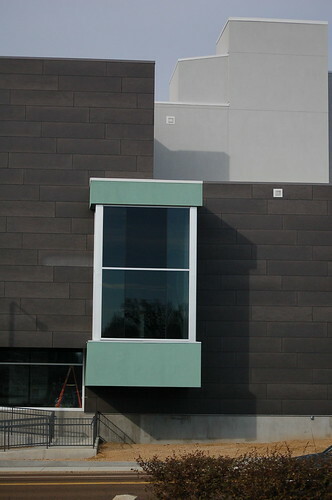 The new theater also is home to rehearsal space, costume and set shops and the company’s offices. One room that’s used for dance rehearsals (Ballet Memphis uses the space) has a spring-loaded floor. 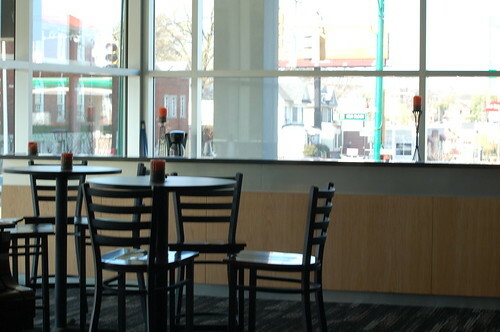 There’s also a spacious lobby with a bar, and a cafe that will one day be fully functional. On the roof, there’s a sound-proofed roof garden that can be rented out for parties. Playhouse on the Square is home to a a professional resident company of actors, designers and technical workers. Currently, Playhouse is showing “Frost/Nixon”, a show about the televised interviews between journalist David Frost and former president Richard Nixon. Nice. Thanks for the interior pics. Very exciting for both Midtown and the entire metro area. WOW, that’s wonderful progress for Playhouse on the Square. A lot of us got our start there back in the day. Thank You Memphis!